While PM Netanyahu’s edits to the Quartet sponsored Roadmap to Peace make it much safer than the purist interpretation of Olmert, it is still not an optimal guarantee against future conflict. It has failed to gain full support from the political right. Why? Perhaps his Administration’s circumspect political demeanor in regards disclosure of the details of his plans has many people concerned. Anyone who cares about the rights of Jews to live in the land of their forefathers is understandably dissatisfied if you are elected to represent them and are seen as not emphatically defending their rights; especially on the heels of the trauma wrought to the national psyche by a previous administration who assaulted those rights. Therefore the existence of this concern is in and of itself something of a failure by the current administration, to meet the reasonably anticipated emotional turmoil of the electorate; a failure to address it and thereby give hope to alleviate it. Building in Jerusalem yet intending to legalize a terrorist state within Israeli territory just doesn't do enough to win over the political right. A failure to communicate by an eloquent speaker is often times viewed as more that it is. Implicit oversights can be seen as rejections of alternatives, because since you speak so well on every other issue, the fact that on this one core issue you do not speak, “speaks” volumes. It is in this light that I bring this critique of the current administration’s peace plan to the fore. At a time when some nations are speaking of supporting the Saudi plan, it is vital to know where we need to go to keep improving from past mistakes and not regress to failed policies of old. For those of you who do not know of the Saudi-pseudo-peace-plan, it is either the worse peace plan ever devised or nothing but a thinly veiled attempt at war by other means. OK, let's be as accurate as possible, it's BOTH. 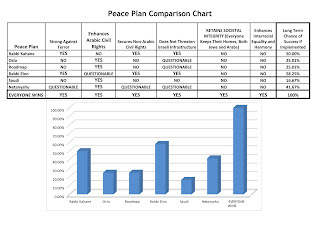 Using the same 6 criteria for lasting peace that I used as qualities of evaluation in the popular original Middle East Peace Plan Comparison Chart, I will now analyze and compare the current Netanyahu variation of the Roadmap to Peace and the Everyone Wins Peace Plan. 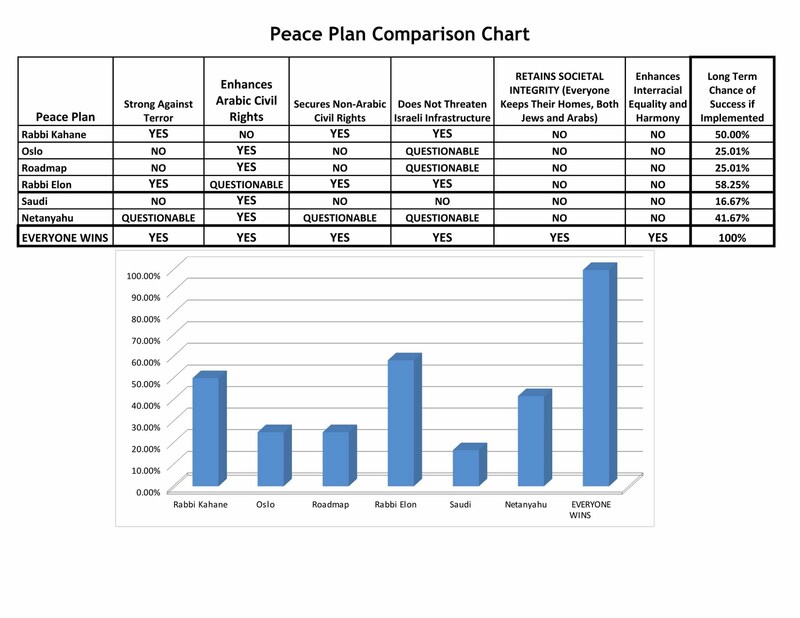 Afterward I will present an updated peace plan comparison chart at the end of this brief essay that shows the stats on those plans and the Saudi plan as well. A word of caution when using this evaluation. To come to an objective judgment while reading such a review of peace plans, especially when it is being done by someone such as myself who is likely biased to present his own variation in the most positive light, you must ignore how well I do or do not communicate this to you, but maintain a focus on the facts. To simplify this, as you read ask yourself the following: Are these 6 criteria truly the main features required of any true peace plan. Then you must ask yourself is my perspective on each criterion accurate when used as the lens by which you evaluate each of the peace plans mentioned here? If that is so, then the conclusions of this evaluation must take hold in your mind and find its way into an expression of political action, be it via a letter to your party leadership (Israelis) or representative in congress (Americans), etc. Your letter to your political representative can turn a blog post into a serious concern of the constituency that the leadership must consider and address. People are suffering and are in danger so we must do something, we must ask ourselves how can we help them. Peace Criterion 1: Strong Against Terror? By guaranteeing full control of Jerusalem, Netanyahu’s plan is much better than Olmert’s. The long term security of Jerusalem’s population is vastly improved. Yet by creating zones of Arabic self rule in the territories, under the current climate, is invariably creating cities of refuge for terror, even if technically a right to invade at will against terror exists in a signed treaty as per the current Likud Party platform. The Western sensibilities against segregationist activity would be exploited to perpetuate the anti Israel media onslaught every time Israel tried to defend itself under such a plan, and likely fuel continued outrage by supporters of the PLO world wide, who would feel like they lost if the Netanyahu plan was initiated, and that would likely encourage the Palestinians to try to prove that they did not. The best resolution to this is if there are no alternate zones, but a single democratic nation of Jews, Arabs, Bedouins, Druze and the like, just as those beyond the “Green Line” already enjoy. Anyone who would then speak of jihad would subsequently not be viewed by the foreign press as freedom fighters fighting oppression, but as alien interlopers who are trying to interfere with a good thing, the betterment of the unified State of Israel. Peace Criterion 2: Enhances Arabic Civil Rights? Unlike its policy towards Jews, Bedouins and Druze, the Roadmap as edited by Netanyahu, plans to give whole cities exclusively to Arabs and no other race. “Jewish Settlements” will not be allowed to be only for Jews, but will be expected to become more egalitarian once within the New Green Line. But Arabs, under the Oslo Accords, the Roadmap to Peace and current Obama and Netanyahu policy, have the right to be racists if they so choose. Regardless, getting cities of your own is always a good thing, so from the perspective of Arabs in the territories, the Netanyahu plan is essentially a good thing even though their leaders do not want it. Peace Criterion 3: Secures Non-Arabic Civil Rights? The Roadmap as edited by Netanyahu plans to give whole cities to Arabs, unlike its policy towards Jews, Bedouins and Druze… Perhaps not fair, but neither is this a certain uprooting of civil rights for those who don’t currently live in those Arab cities. Long term, however, the other races should be allowed to move into Arab cities if they want to, but that is not a pressing debate in the short term. Peace Criterion 4: Does Not Threaten Israeli Infrastructure? It may not, or it may. By creating zones that are outside of IDF jurisdiction except under hot pursuit, you are creating a framework that will inhibit intelligence gathering and reasonably could lead to severe danger to Israeli Infrastructure. However by not moving major populations such as Ariel’s Jews or Hebron’s Arabs, the Netanyahu Roadmap avoids a major economic crash that would have followed a purist interpretation of the Roadmap to Peace. Peace Criterion 5: RETAINS SOCIETAL INTEGRITY Everyone Keeps Their Homes Both Jews and Arabs? Currently plans are to close small satellite settlements but none of the major ones or those near them. That means Jews are still to be made homeless under the edits by Netanyahu to the Roadmap, just not as many Jews. That is little solace, and a failure of this criterion’s test. Peace Criterion 6: Enhances Interracial Equality and Harmony? Creating cities that are void of Jews in the Land of Israel is not the ideal method to achieve this. Better than Olmert’s path? Certainly. Better than the Saudi-pseudo-peace-plan? Without Question! But in its current form, Netanyahu's current plan appears less than 50% probable that its viability will stand the test of time. Long term viability for peace is most likely when societal healing occurs and as many causes of long term hatreds and outrages are minimized or eliminated to the best of our ability. That is what the Everyone Wins Peace Plan is founded upon. By integrating the Everyone Wins Peace Plan into their platform for peace, the Administration can find an optimum avenue towards lasting conflict resolution between Palestinian Arabs and Israel, by the grace of God.